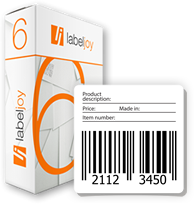 With Labeljoy software generator you can create the Code 128 barcode, a very high-density barcode symbology. Labeljoy allows to encode all 128 ASCII characters with code 128. Code 128 is used as base symbology to generate EAN-128 and GS1-128 barcode symbols. Labeljoy requires you to enter an alphanumeric text up to 48 characters long to generate the barcode. Enter the text in the text box. The visually readable text can be displayed below, above, or hidden according to the setting specified in the Text combo box. Text length must not exceed 48 characters.